Ramsgate is riding the crest of the wave when it comes to kitesurfing. Not only is it a record-breaking destination (in November 2016 kitesurfing Vice World Champion Lewis Crathern broke the British record for the highest jump on Ramsgate sands – a whopping 22.3 metres), but in 2018 it was also the venue for the final round of the British Freestyle Kitesurfing Championships. The event was such a success that the Championships are returning this year for the final round on August 24 and 25. It’s being sponsored by Active Ramsgate, an initiative of Ramsgate Town Council designed to regenerate the town through the promotion of Ramsgate’s inspiring range of outdoor leisure pursuits. Kitesurfing being one that is growing rapidly in popularity with new visitors travelling to Ramsgate to take advantage of the great conditions. "Ramsgate lends itself to a very strong wind from both the South and the North, kitesurfing works quite well off the beach, and the waves can get really good. I went there for the strength of the winds, but also because it's a beautiful place - the big white cliffs make it an aesthetically pleasing place to ride. I like all the bars and shops on the seafront, it's always a nice visit to come down here, and I feel very welcome" says Lewis Crathern. “Ramsgate is a fantastic place to kitesurf because when the wind turns on and the waves clean up, we have amazing kickers for boosting big air off and the gaps between them make for easy landings. To celebrate the British Freestyle Kitesurfing Championships returning to Ramsgate this year, Active Ramsgate is offering kitesurfers the chance to win an exclusive prize, a once-in-a-lifetime opportunity for 1-to-1 tuition with none other than Vice World Champion Lewis Crathern. This experience is open to experienced kitesurfers only. 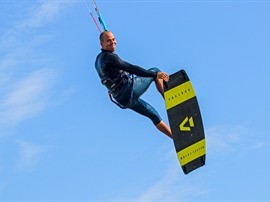 Lewis will meet you in Ramsgate where he will take you out on the water and you can benefit from his expert coaching, helping you to instantly elevate your kitesurfing to the next level. After the session on Ramsgate Sands, you will have the opportunity to catch up with Lewis and sample the local seafood at one of the award winning restaurants surrounding the only Royal Harbour in the UK. To be in with a chance of winning this exclusive prize, simply email activeramsgate@ramsgatetc.org.uk with the answer to the question below. Please put KITESURFING in the subject line. Q: How high was the record breaking jump Lewis Crathern recorded on Ramsgate Sands in November 2016? The Active Ramsgate team will randomly pick a winner after the closing date of 19 April 2019. A suitable time will be arranged with Lewis for the kitesurfing session to take place in Ramsgate. To find out about kitesurfing and other outdoor activities in Ramsgate visit www.ramsgatetown.org/activeramsgate and check out www.visitramsgate.co.uk to plan a short break to this stunning coastal resort.